Guess what! It is time for another challenge from the Paper Craft Crew. This week we are bringing you the Paper Craft Crew Card Sketch #81. Did you know that I create all the Card Sketches for the Paper Craft Crew? I really enjoy creating the sketches (and I DO have my favorites!) and I really enjoy seeing all the different cards people create based off of one card sketch. So, we invite you to come play along as this challenge starts today and ends on Tuesday, February 25th at 11:55 PM EST. Have you ever used the Stampin' Up! Color Coach? I don't use it that often but decided to pull it out and use it with this card sketch. I'm so glad that I did and I just love the color combination. I started with the Crisp Cantaloupe color then added Pink Pirouette and Soft Suede. 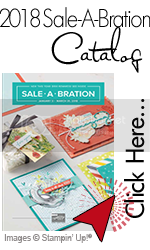 The card base starts with Whisper White Cardstock layered with Crisp Cantaloupe cardstock and a layer of Designer Series Paper from the Sweet Sorbet which is a Sale-A-Bration item. Next, I created a Soft Suede layer with Whisper White stamped with the floral image from the Gifts of Kindness Stamp Set which is also stamped with the Soft Suede Classic Ink. Don't you just love the silhoutte image of the flower? This sketch is fairly simple so as I looked at adding embellishments, I couldn't resist using the Essentials Wooden Elements stamped with the "Celebrate" sentiment from the Starburst Sayings Stamp Set. Then I added an arrow stamped using Pink Pirouette Classic Ink from the Peachy Keen Stamp Set and cut out using the On Film Framelits Dies. The finishing touch was adding the button from the Subtles Designer Buttons tied with Silver Baker's Twine. The colors are really lots of fun, subtle and perfect for this card sketch. So, I hope you enjoy and PIN my card. Don't forget to visit the Paper Craft Crew Blog to check out the creations from the other Design Team members!